Delonix regia is a species of flowering plant from the Fabaceae family, noted for its fern-like leaves and flamboyant display of flowers. 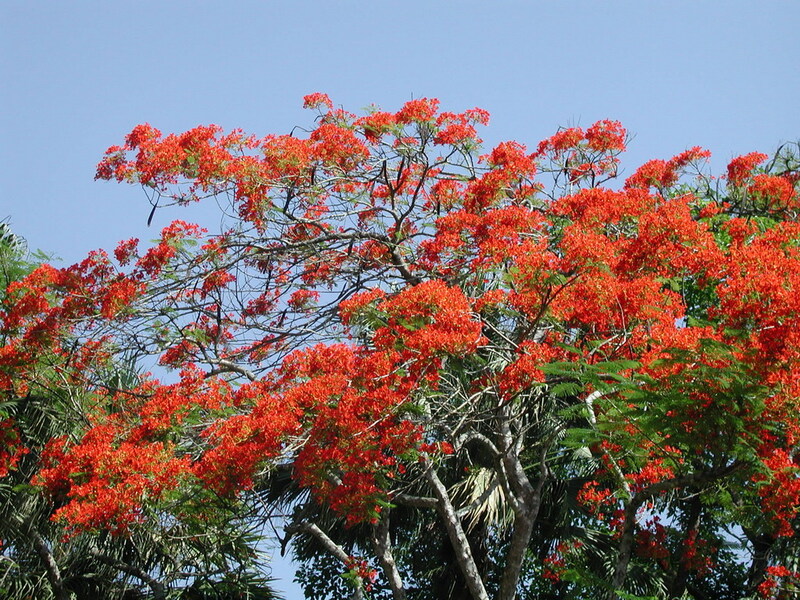 Often grown as an ornamental tree and given the name Royal Poinciana or Flamboyant. The Royal Poinciana is endemic to Madagascar, where it is found in the Madagascar dry deciduous forests. In the wild it is endangered, but it is widely cultivated elsewhere. In addition to its ornamental value, it is also a useful shade tree in tropical conditions, because it usually grows to a modest height but spreads widely, and its dense foliage provides full shade. In areas with a marked dry season, it sheds its leaves during the drought, but in other areas it is virtually evergreen.